I am battered down inside from the terrible winds today-40mph and 7 degrees out-brr! A sharp contrast from a great walk at the end of the day yesterday. I snuck away to the library and stole my daughter’s laptop to blog in peace and quiet of the library. First, let me show you what I fell in love with yesterday. I am such a sucker for the runt of the litter. The one on the right is Junior-I would name him Moose JR. Except it is a him and probably wouldn’t work too well with my two females…. I just love puppies. You come for quilts, I know. 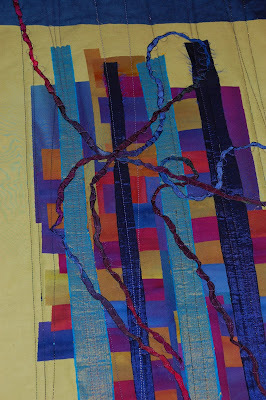 I have been madly sewing on Project Joy #9. I will definitely make the deadline but have decided it needed to be handquilted and have all sorts of embellishment. I really like it. It is of the same piece of material of the last small work I showed you hung on my tree. I can’t count it as done yet but just need about two more inches and the binding. The photo is a bit too red. But here’s another of the hand work. 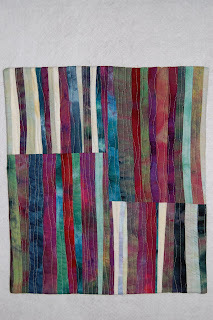 The cloth was a large piece of hand dyed fabric. I overdyed it and the bottom was much lighter. This is from the bottom. The lightest green and yellow did not come form the cloth. Amazing how different one piece of cloth can look like in composition! Both pieces are about 12 x 15. I’ll post with them side by side when done. Better go- stay warm. Happy sewing, my friends. This entry was posted in project joy, small works on December 29, 2009 by Colleen Kole. 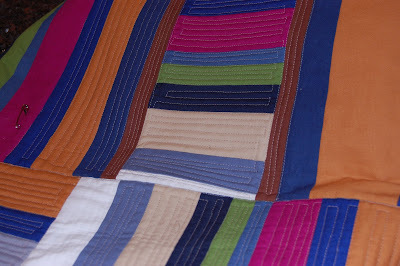 I read last night that it takes about 500 hours to become proficient in machine quilting. Since I only have at the most 250 hours in , I guess I have no choice but to continue. I have decided today, I will minimize what I rip out and just keep going. None of these would be for a show and I need to kind of go with what the quilt is and that is improvisational. I also took one of their suggestions and tipped my machine back a bit by putting a small book under it. I think that helped to open up my line of vision. 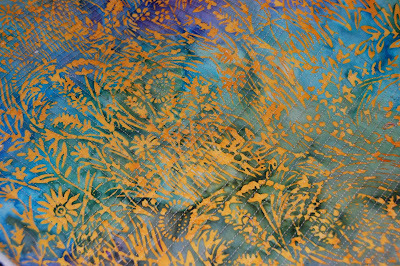 I picked this beautiful batik of Vermont wildflowers for the back. It was made for a shop hop so I don’t think you will find any left. I will not fight with the process today! I did finish another UFO. It was really fun. It has lots of fun stuff in it: recycled raw edge silk, hand-dyed silk ribbon, hand-dyed linen(the deep blue background), hand-dyed cottons, metallic thread, and it’s fused. I can’t use it for a challenge because it is three inches too big on one side. Have to think of something else…. Fortunately, it’s done. Unfortunately, I didn’t count it on my personal list for Project Joy! Happy sewing, my friends! 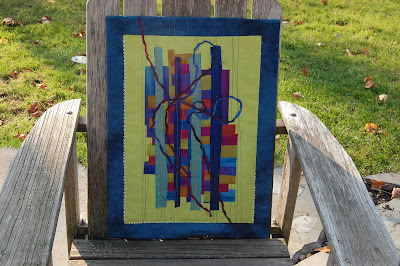 This entry was posted in machine quilting, project joy on November 11, 2009 by Colleen Kole.